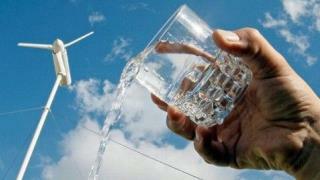 (Newser) – A French inventor may have an answer for the millions of people who scramble to find fresh drinking water each day: a wind turbine that literally pulls H2O from the air. Marc Parent, head of Eoie Water, designed the turbine while living in the Caribbean and enduring water shortages. His solution is called the WMS1000, which gathers moisture from the air and turns it into drinking water, ABC News reports. On average, each unit creates over 62 liters per hour when the temperature is 75 Fahrenheit with 45% humidity, according to the company website. "each unit creates over 62 liters per hour when the temperature is 75 Fahrenheit with 45% humidity." At what wind speed? Does the unit produce electricity and uses it to extract the water from the air? If so, does it also provide electricity for home use, and if so, how much goes for each purpose? OWEN :"What I really need is a droid that understands the binary language of moisture vaporators." Science Fiction calls it again. As we trash our ground water, more people may want to do this. At what point does it become detrimental to the environment as a whole?